Packed with weather-resistant steel strands and a flexible fibre core, our 6×19 galvanised rope is ready to face any challenges the skies and seas can throw at it. With a 13mm diameter product available in this range, you can get good lifting strength along with the inbuilt malleability. Read on below to find out more about our 13mm 6×19 Galvanised Wire Rope. The benefits that the 6×19 structure of this galvanised rope have already been mentioned, but it still makes sense to see the abilities of this 13mm example so that you can ensure safe lifting practices are adhered to in your particular operational environment. First up is the 10,366kg maximum working load limit, available on the 1960 iteration of this rope. The 1770 grade example comes with a slightly lower 9,361kg capacity, which is something to keep in mind. Next you need to consider the advantages of galvanisation itself. This means that corrosion will not occur if the steel is exposed to water in almost any form. Rain and snow, or indeed the splashes of sea waves, will do little to tarnish it. Wire rope is our speciality and you can get everything from non-rotating rope to forestry rope right here at Rope Services Direct. 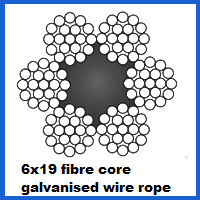 So if 13mm 6×19 galvanised rope is not on your wish list, we can still fulfil your needs. Head to our contacts page to email the RSD team, or call direct on 01384 78004 for fast, effective advice and competitive quotes for all wire rope orders. 13mm 6x19 Galvanised Wire Rope Overall rating: 5 out of 5 based on 6 reviews.